Uranus, a huge gaseous world some 1.8 billion miles from the sun, is quite stormy. NASA's long-lived Hubble telescope spotted a notable storm churning inside the planet's blue-green atmosphere, and the space agency posted the image online Thursday. 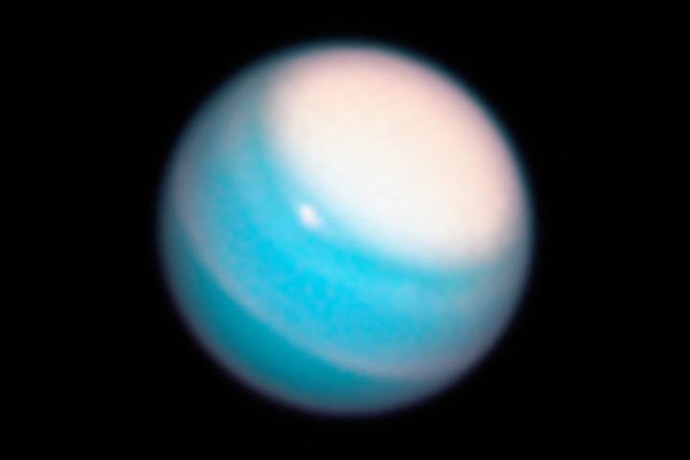 The entirety of Uranus' north pole is engulfed by a "vast bright stormy cloud cap," wrote NASA. "Scientists believe this new feature is a result of Uranus' unique rotation," added NASA, noting that, unlike the other planets in our solar system, Uranus is tipped on its side. This leaves the sun shining non-stop onto its north pole during its long summer, likely resulting in widespread atmospheric changes. Just beneath the massive polar storm is a smaller, compact white cloud made of the common gas methane, notes NASA. The space agency also spotted a new storm brewing on Neptune. It's the dark spot near the top of the planet and is somewhat mysterious, as these massive dark storms have been observed appearing and then vanishing relatively quickly. "The feature is the fourth and latest mysterious dark vortex captured by Hubble since 1993," said NASA. NASA plans to continue monitoring weather on these frigid, far-off gas giants to better understand the extraterrestrial storms. "Just as meteorologists cannot predict the weather on Earth by studying a few snapshots, astronomers cannot track atmospheric trends on solar system planets without regularly repeated observations," the space agency wrote. "Astronomers hope that Hubble's long-term monitoring of the outer planets will help them unravel the mysteries that still persist about these faraway worlds."